Some of the miniatures we work with aren't so miniature. 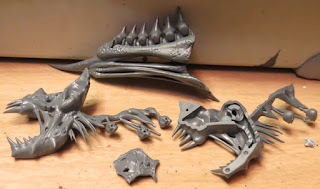 These can be as simple as gluing a few large parts together or as complicated as assembling numbered pieces in a bit of a jig-saw like manor similar to building model cars. 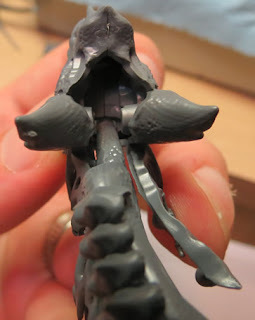 In this article I'm going to look at a few of the "gotchas" when building these larger figures and offer some tips when you've got a project of this scale on your own desk. Sometimes it's an easy matter to figure out intuitively how to build a larger figure. 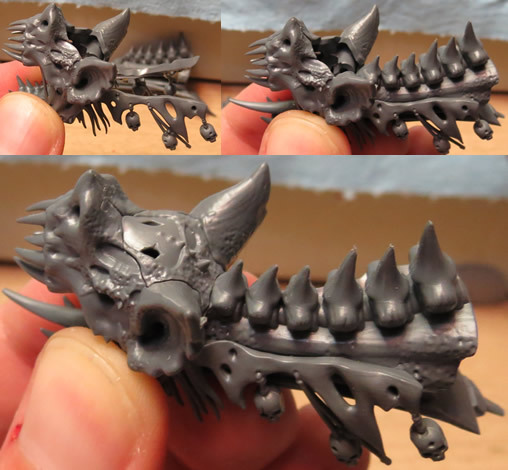 But in the case of this monstrous undead bat, not so much - the package actually allows you to build it as either a bat or a dragon. Luckily, these kits usually include some kind of paperwork to show you how it's done. I usually like to build these kits in sections and fit everything together before gluing it. This tells me I have the right parts and I've cleaned off any mold flack that might be in the way. Sometimes, even with instructions, it can still be tricky. Trying to get the spine in place actually took a few tries to figure out exactly how it was supposed to fit. That's exactly why you should glue after you know how it goes together. If you're moving parts around too much, plastic glue likes to get all over the place and can eat away detail while superglue becomes weak fast. Parts often have numbers next to them on the sprues of larger kits. That way the instructions can tell you exactly which parts you glue together. 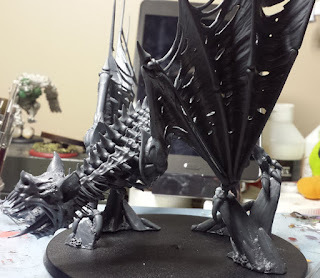 I mentioned this kit can be a bat or a dragon? Well the 2 parts below look almost identical and the pictures in the directions weren't clear enough to tell the difference. They were numbered, but I'd already cut them out. 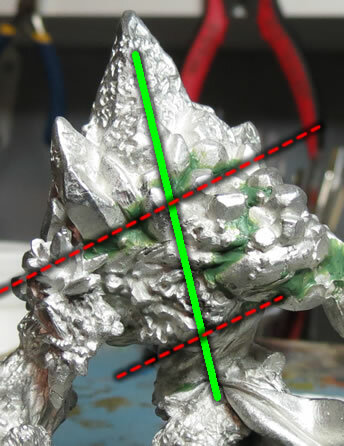 I've discussed pinning before, but even if the model you're building is relatively straight forward to put together, if there's a lot of weight to it like in the case of a fist-sized pewter beast, it's still a good idea to pin it. 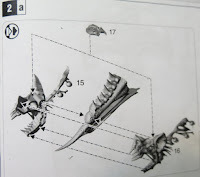 In the article above, I cover the details, but it basically means drilling a hole on two sides of a joint and using thick metal wire to act as a skeleton. There are a lot of great miniatures you can personalize by posing these days, but larger or complicated figures are often static. 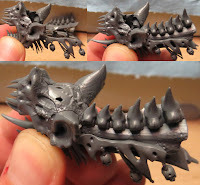 This is usually because in order for the miniature company to create such a unique piece of art, it would be difficult to also make it customizable. You can still repose these figures using pinning (Mentioned above.) though you might also have to glue in some wire to act as supports if you're making changes to in areas that are too thin to pin. 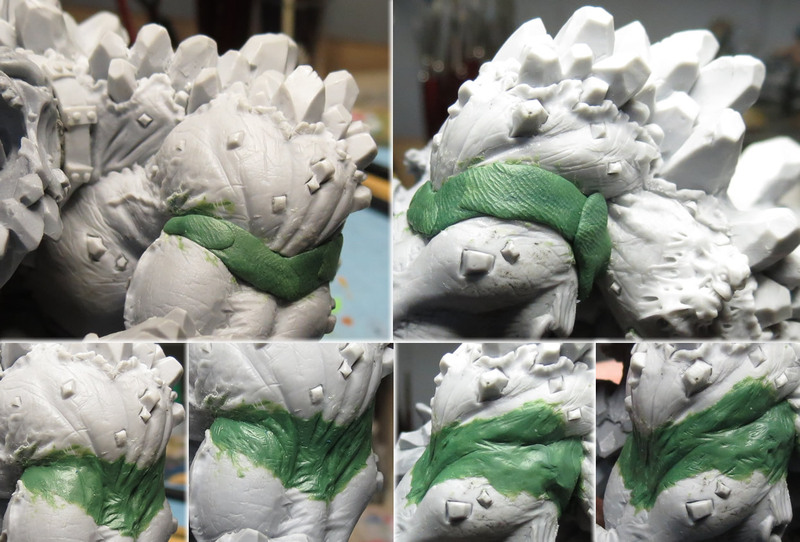 Making changes to models that aren't meant to be changed often means you'll have to use something like Green Stuff. This could be something as simple as filling a few holes to resculpting a major part of the body.